Looking to upgrade from the boring factory indicator lamps that came with your ARB Bullbar to something more Hi-Tech. Well look no further because ARB has just released their new LED Combination Indicator/Clearance lamps to take your Bullbar to the next level. 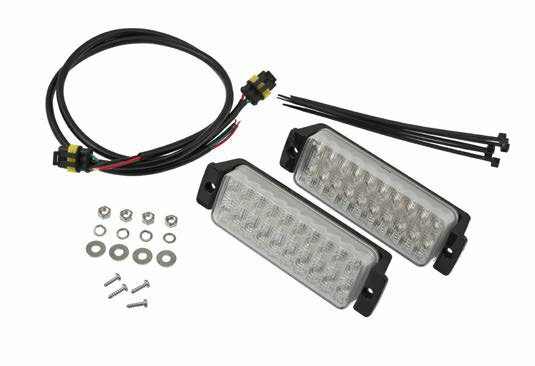 16 amber Indicator LEDs keep you safe and legal while 4 bright white Clearance LEDs are there to lend a hand on those night time wheeling trips. Note- Fits ARB Bullbar equipped with original 6821151L and 6821151R indicator lamps. Fits ARB Bull Bar equipped with original 6821151L and 6821151R indicator lamps. Will these fit the deluxe bull bar ARB 3450230 for the Wrangler ? The light itself is 5 3/8" X 2", with the mounting bracket attached it is 7 7/8" X 2".